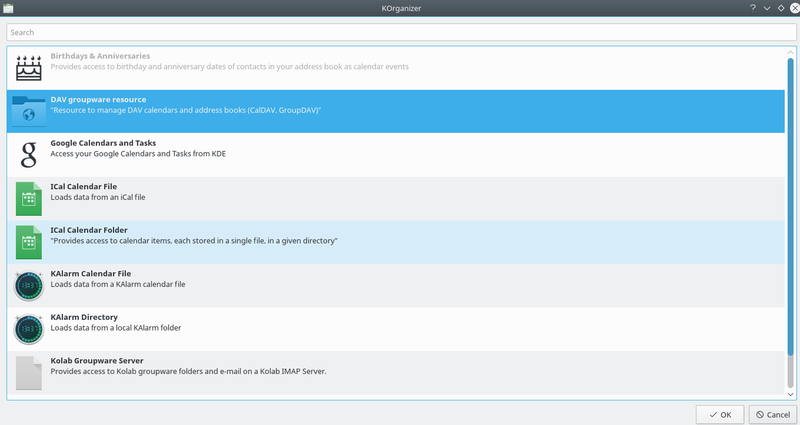 » MS Exchange Email + Calender for the KDE Desktop? MS Exchange Email + Calender for the KDE Desktop? I would like to replace MS Outlook, fully. The server as many companies is MS exchange to be used. Would you know a way to get MS Exchange Email + Calender for the KDE Desktop? Emails and meeting support under the fabulous KDE. Re: MS Exchange Email + Calender for the KDE Desktop? Kontact could be a descent alternative; the bundle of software: KMail, KOrganiser ... https://community.kde.org/KDE_PIM, has served as a good PIM for my purpose for 15 years ++. However, with major upgrades, version upgrades, you should be aware that the migration tools doesn't always work, and as such I always do it manually; hence, I would suggest you read up on KDE's directory structure, which change from time to time (by default that is; you may actually overwrite it and do whatever you like, if you know how to), and reserve some time when doing those upgrades. This thread is probably in the wrong subcategory. I see as the picture shows no way to let MS Exchnage calendar be with korganizer, in 2018, after about 20 years of debian there... . I believe, is that right? I'm not sure if I understand you fully, and my first reply may suggest I have misinterpreted what you meant; if you want to import data from MS Outlook 's components to Kontact's similar ones you may find it might or might not work, I have never done that so I do not know; but, if you want to change fully to another «suite» similar to MS Outlook , I think Kontact could work just fine. not KDE specific, but Thunderbird might work as a replacement for outlook. import mail from outlook works fine, but haven't tried import from exchange calendar, i think you need an extra addon for that. I always found evolution to fit my needs best as outlook replacement. You also need the packet evolution-ews (Exchange Web Services) when using with Exchange server.